It is tough not to have Internet access. Anyway I finally got one of the watches I have always wanted. As I wrote earlier, I traded a number of my Casio G-Shock for this watch. It is a good trade as the G-shocks is going to a good home with a good friend. A big thank you to my friend. I got the Bell and Ross BR01-92 Carbon in the trade. I always like the watch since it was launched in 2005/ 2006. I also like the story behind the brand. It comes with a number of straps. I also learnt something new as well. It seems the watch is from the early batch and it comes with the slimmer strap tip, 24/ 20 mm. The lug width is 24 mm but it tapers down to 20 mm. 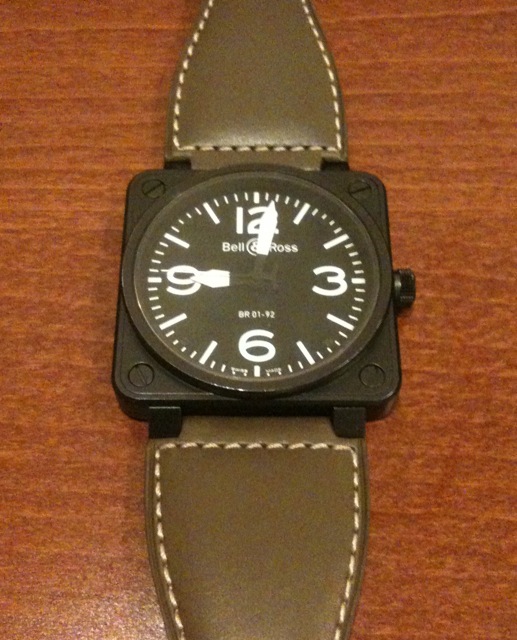 The later batches comes with the 24/24 mm strap. Of all the straps that I got, the interesting one is the green/ brown military type strap. I have never seen this strap before. It is original as confirmed by the local Bell&Ross AD. I do like it. It is the older 24/ 20 mm version. I also got 2 other leather straps, a 24/ 24 mm and a 24/ 20 mm black strap. Additionally, I got the 24/ 24 mm black rubber strap and the nylon strap. I also got 3 buckles with the trade, 2 PVD black buckle, 24 and 20 mm, including another stainless steel (brushed finish) 24 mm buckle. I am a happy. The watch, sorry for the poor photograph. You can see the green/ brown strap fitted to the watch. I will write more once I get back from my holiday. Photographs from the owner. Note the wabi-sabi on the watch. It is has been his daily wear since he got it. And I have to say that it does not look as bad as the photograph. 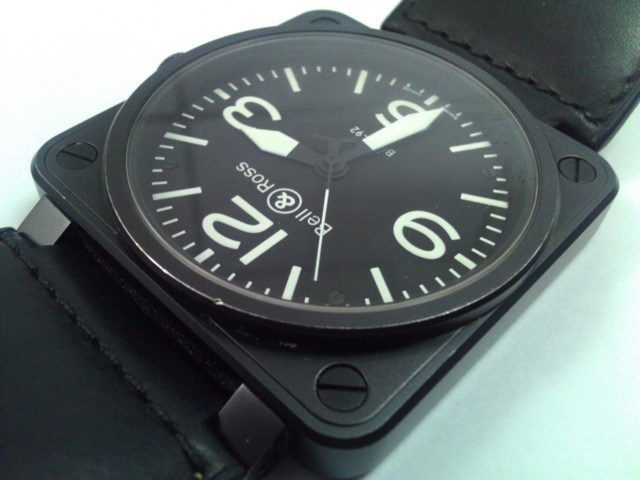 The PVD black coating seem to be quite robust. You can see some dings on the 'bezel'. 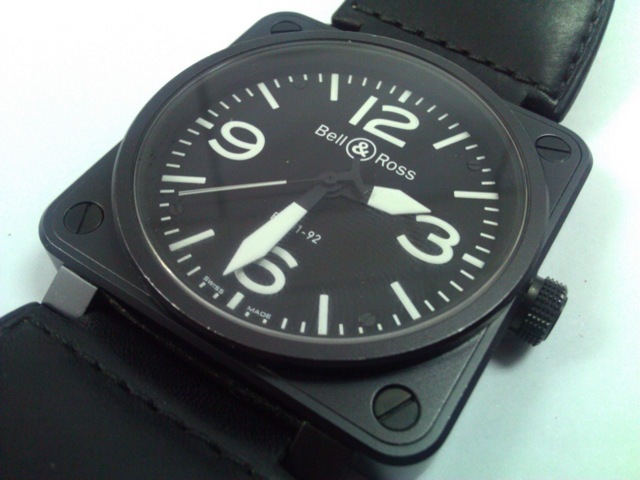 It is fitted on the 24/ 20 mm black strap. Arrgh - Can I tell you I meant that you got the BR01 version? Nice piece, for now, that's my grail watch, something very 'pilot instrumentation' that I love about it. Does the square body sit well on your wrist? It is a nice watch and what makes it nicer is that it is from a good friend. The watch is used but nice. Still in good condition. It comes in at 46 mm, but it is very comfortable. It is not too big. Will post photographs of the watch on my wrist soon.